Calhoun, C. (2014). Using Wikipedia in information literacy instruction: Tips for developing research skills. College & Research Libraries News, ?, 32-33. Wikipedia entries can help you refine a rough topic idea through the subheadings within an entry (Calhoun, 2014, p. 32). For example I searched for the term “genre.” There I saw the subheading of “audience,” a focus which could certainly apply to information literacy (Information sources have audiences, after all.). Readers can also use Wikipedia to find keywords and names for further research (Calhoun, 2014, p.33). To use the genre article again, I read the audience section and found the phrase “antecedent genre.” Since new genres can spring from antecedent genres, this is another important concept: I was glad to be reminded of the term. If an article has some inaccurate details, the search terms could help the researcher cross-check the facts. Many Wikipedia entries include a list of references (Calhoun, 2014, p. 33). Mine led me to a classic article on antecedent genres (Jamieson, 1975). Some entries may have inaccurate or less-than-credible references, which could provide a teachable moment. Of course these uses overlap with one another. The additional reading can lead to additional search terms, etc. 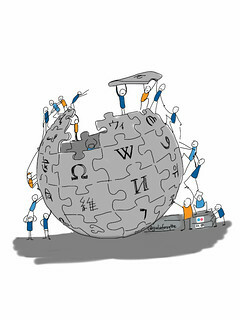 Still, the article outlines some appropriate uses of Wikipedia, a tool like any other. Let’s use it wisely.